eXelsius® is a leading provider of advanced thermal solutions that enhance the yield of electronics assembly. From back-end semiconductor packaging through printed circuit board assembly to organic and printed electronics, we offer a wide range of thermal equipment. With over 2000 ovens installed worldwide and more than 500 customers in Europe, eXelsius® capitalizes on more than 20 years of experience, including the acquisition of Thermatech thermal business in 2003, and continued investment in R&D. eXelsius® offers its customers a unique combination of technological innovation, highly competitive equipment, and an unparalleled commitment to the quality of service. 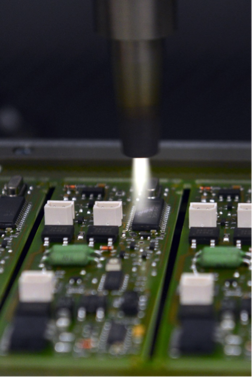 We offer Forced Convection Reflow ovens (XRC), Forced Convection (XPC), Infrared (IR) (XCC), and Ultraviolet (UV) (XUV) curing systems, and Activation Surface equipment by Atmospheric Plasma (Genius), 3D Solder Paste inspection (SPI), 2D/3D Automated Optical Inspection (AOI) systems from Vi TECHNOLOGY®, dispensing equipment for Glue, Underfill, Dam & Fill, Glob Top applications and selective Coating cells from Nordson ASYMTEK. These equipment can be offered as single units or as complete solutions for SMD lines and Conformal Coating lines, including board handling equipment.